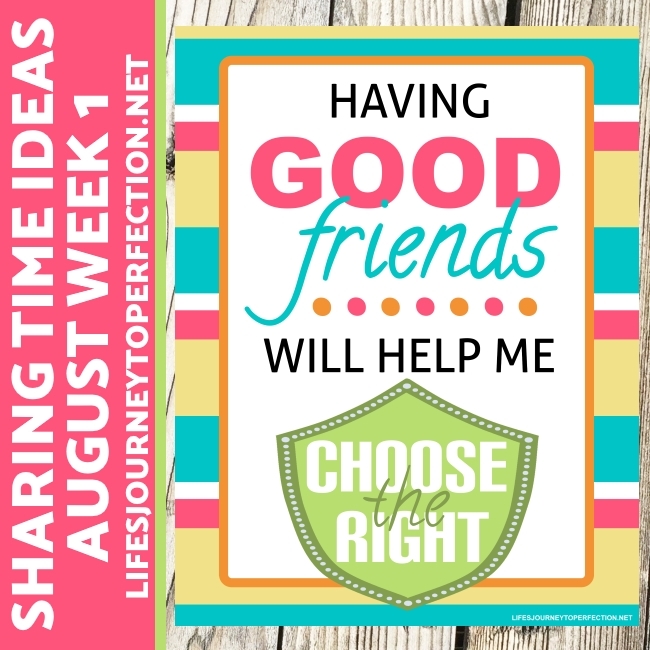 Life's Journey To Perfection: 2017 LDS Sharing Time Ideas for August Week 1: Having good friends will help me choose the right. August Week 1 Topic: Having good friends will help me choose the right. To begin sharing time play the following movie, "Gordon Hinckley: Lessons I Learned as a Boy", discuss with the primary that having good friends can help us with choosing the right. Show this week's theme poster and invite the primary children to repeat, "Having good friends will help me choose the right." On the board place a paper doll figure. Explain that Heavenly Father did not send us to the world to fight the adversary by ourselves. He has given us families, leaders and the opportunity to choose good friend. When we choose friends who have the desire to do good and choose the right, they can help support us and we can help each other defend against the adversary. Under the primary children's chairs place the paper dolls with shields. Invite the primary children to reverently look under their chairs. Continue with each paper doll. 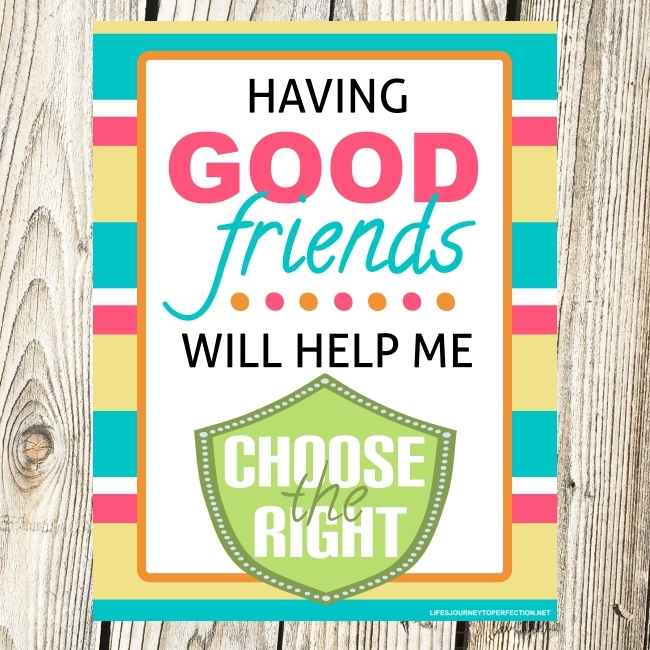 Invite the primary children to share their experiences when either a friend has influenced them to choose the right or they have helped a friend to choose the right. Explain that just as it is important to choose good friends that will help us choose the right, it is important to be a good friend and influence others to choose the right. Bear your testimony on having good friends. 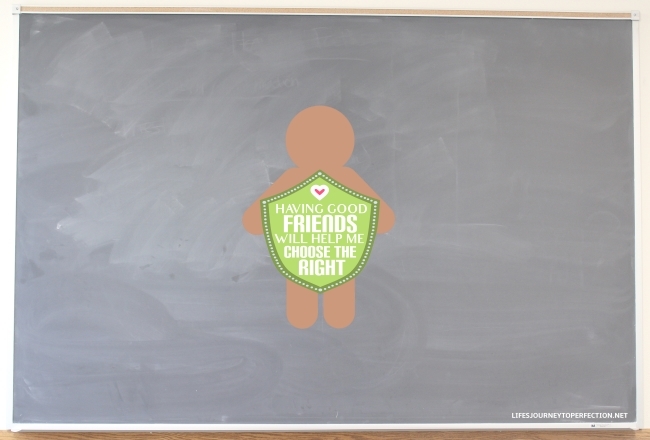 At School: Our friends can be a good influence on us. They can help us to be honest, to work hard and listen to our teachers, and to be kind to others. 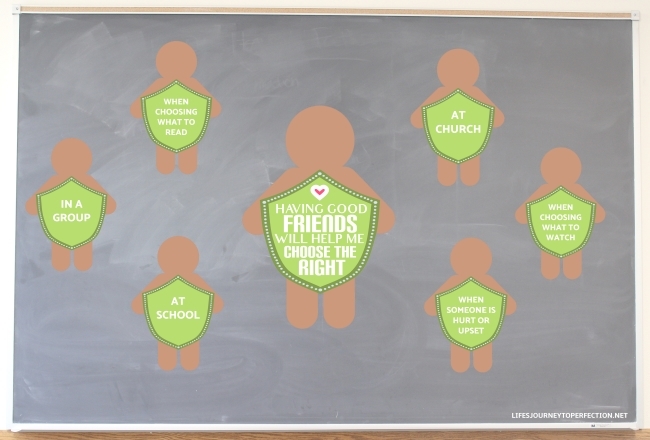 At Church: Good friends can help us to be reverent and to keep the commandments. In a Group: Good friends will help us speak kindly about others and to treat them kindly also. They will help us to make good choices and stay out of trouble. When Choosing What to Read: Good friends will help us choose things that are uplifting to read, because they keep the standards and are reading uplifting things themselves. When Choosing What to Watch: Good friends will help us to choose things to watch that will uplift and inspire us and help us stay away from things that will drive the spirit away. When someone is Hurt or Upset: Good friends have empathy for others, they can help us to serve and hare for those in need. They will encourage us to stand up for those who are bullied or who don't have friends. For more ideas about Friends see the For The Strength of Youth or Friendship. Thanks so much for the Gingerbread men paper dolls. I'm going to make gingerbread men to give out to the children to remind them to be a good friend this coming week. I just wanted to let you know that I use your Sharing Time ideas almost every week. They are spot on as to topic and engagement. My Primary kids love them. Thanks for all your hard work. I just need you to know how much a appreciate you doing this. You are so wonderful to take your time to help us out when we cant quite figure out an idea for ourselves or to pull some of your things in with our own. Thank you!!!!! Your ideas are just what I need. So happy you do this. Thank you so much for taking the time to put all this together! It sure saves me some weeks as all the time I have to prepare is half an hour Saturday night! Thankyou! you are a blessing when life gets busy and I haven't had time to prepare a lesson till Saturday Night. I get ya! Life can get crazy at times :) Glad the ideas are helpful! Thank you for these free printables for week 1! So helpful, and will help make the lesson more fun than I could have come up with on my own.